My mum always cooks this dish for us every year. Without fail. The sad thing is that not many of us would eat it since the steamboat would have fulfilled our quota of how much we could eat at the dining table. Well, not that this plate of vegetables isn’t nice; there are so many other plates of delicacies like shabu shabu, fresh prawns, raw fish, abalone slices, fishballs (yes, my favourite!) etc etc. Vegetables? I could afford to eat healthy some other day. Nevertheless, I do still take a few bites of the vegetables because I know she makes it especially for the lunar new year, especially for the family – only once a year. I’ve always wondered what the origin behind this simple and plain-looking dish is and why she insists on cooking this traditional Teochew dish year after year. After asking around and doing a bit of research, I finally understood. 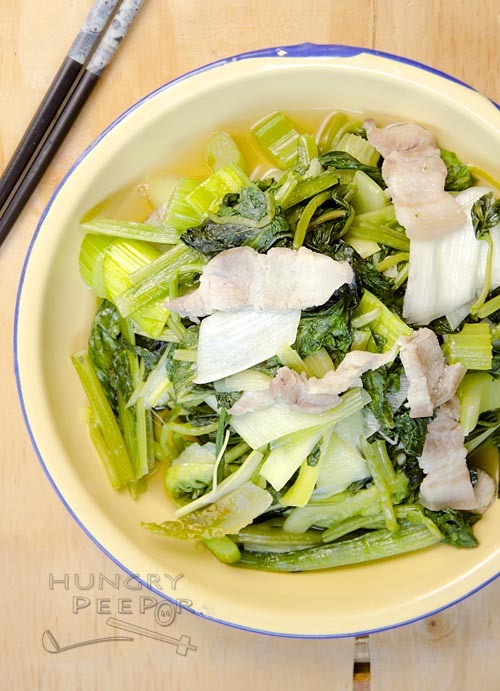 Originating from 潮山 (Chao Shan), South China, 七样羹 or 七样菜, meaning ‘seven types of vegetables’, is a combination of all the spring vegetables available during the Spring season (which is when Chinese New Year is being celebrated). This is also the harvest season for farmers and when vegetables are in abundance. This range of vegetables that are being harvested are known as the ‘spring vegetables’. Farmers would celebrate this abundance by cooking all of these vegetables at once, hence the name of the dish. In so doing, it symbolizes wealth and prosperity and bodes well for the new year as well, since it is usually the better-off who could afford such luxuries of having so many different vegetables in a single dish. Well, there are actually many variations of how this dish originated, and what I have narrated here is just only one of the many. Marinate pork belly overnight with fish sauce and sesame oil. Heat oil in wok. Add pork belly and stir-fry 30 sec. Add garlic. Stir-fry till fragrant. 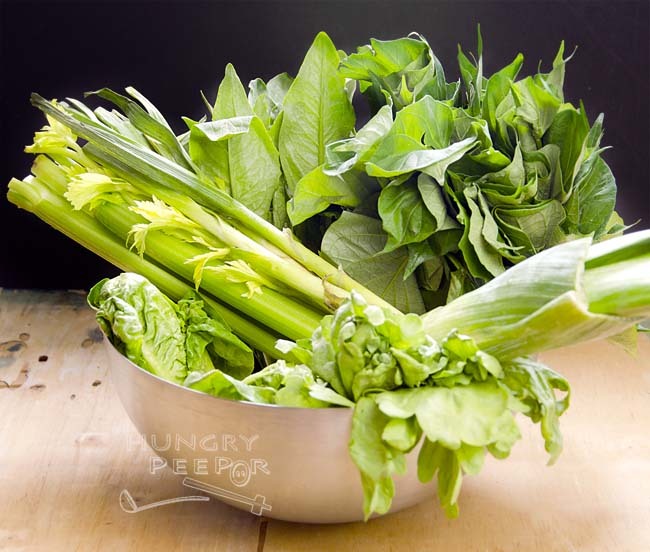 Add all the stems of the vegetables, including spinach, xiao bai cai and kailan, as well as all of the celery and leek. Stir-fry for 1 min. 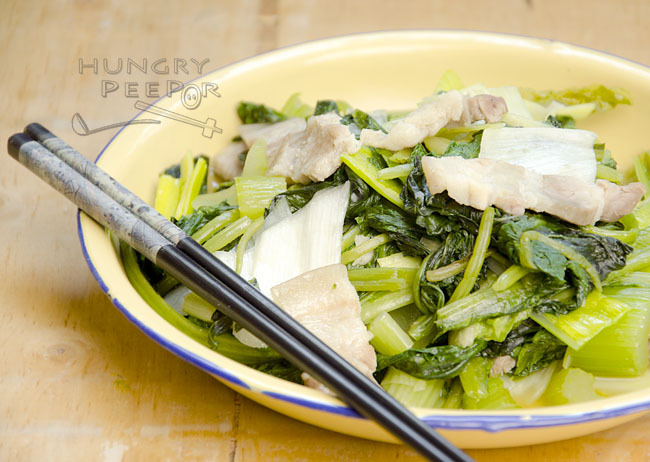 Add all the leaves of the vegetables, including spinach, xiao bai cai and kailan, as well as all of the scallion and Chinese chives. Add Shaoxing wine, salt and fish sauce. Leave to simmer for 1 min till leaves are starting to soften. 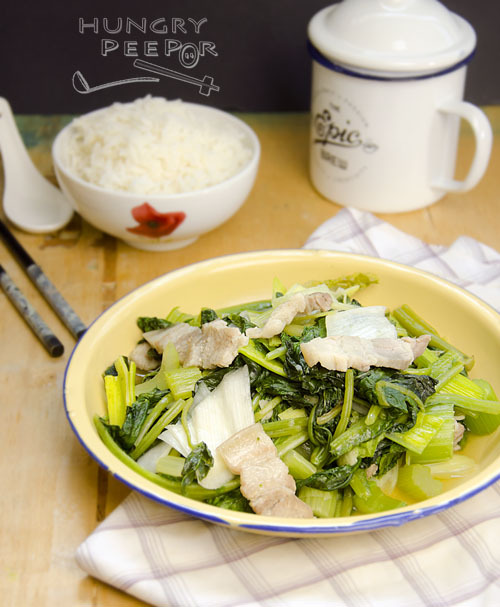 According to many different sources (my parents, recipe bloggers who have tried making this dish etc, you could also use other types of spring vegetables to cook this dish – spinach, kailan etc, depending on your preference and the availability of the vegetables locally. I’ve had difficulty locating (and identifying) swiss chards and mustard greens in the market and hence decided to substitute these with other vegetables. My dad said: ‘Pork belly is a must!’ That does not make it authentic, just more fragrant and nicer in taste. It’s optional, really. My mum says that you can simply go to the supermarket and ask the vegetable monger to give you enough for 7 vegetables. They will know what to pick for you so you don’t have to worry about the selection at all. The vegetables will release a lot of water during the cooking process, so it is not necessary to add any water to it at all. This entry was posted in Chinese, Vegetables and tagged Chinese New Year, Stir-Fried, Teochew. Bookmark the permalink.